There are well over a thousand known iron age hill forts in the UK, but Maiden Castle is the biggest. It may even be the biggest in Europe. 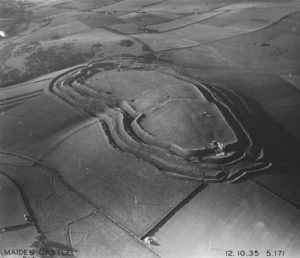 If any of them deserve the title Castle, then it’s Maiden Castle in Dorset. Hill forts consist of earthen embankments and ditches around a hill top. 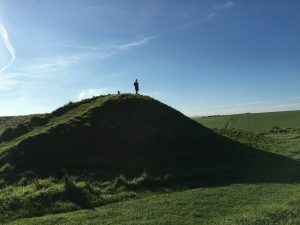 Maiden Castle has four sets of embankments around the highest hill in the area. When it was built, the ditches cut into the hill embankments would have revealed the chalk under the grass, making them bright white. I like to think they kept them clean to make the hill fort more impressive and obvious. People lived inside the forts and farmed the areas outside. That’s pretty much everything we know for certain about hill forts. The people who lived in them didn’t have a written language, and they were going into decline by the time to Romans arrived, so archaeologists have had to reconstruct things from evidence found on these sites, and the occasional written record from outsiders, plus generalising from other sites. You see these places are old! 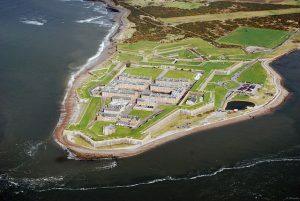 There are several places called Fort George across the world, and two in the UK. I’m not writing about the one in Guernsey today, but rather the one in the highlands of Scotland. It’s not technically a castle because it is a military installation, and was never intended as a high-status residence, but it’s interesting enough that I thought I would bend the rules a little. When gunpowder weapons were first developed they had many benefits, but they lacked the power of a trebuchet. Sieges therefore remained as they pretty much always had done, only with more smoke and loud bangs – cannons were primarily an anti-infantry weapon, and thus useful in defence but not really in bringing down a castle wall. 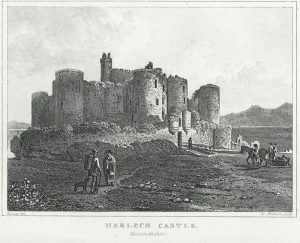 Castle designs changed somewhat to accommodate gunpowder, and where one once would have seen arrow slits castles were being built with gun loops and cannon ports. Over time, though, cannons got more powerful, and were able to make big holes in stone walls. The mobility and relative accuracy of cannons made the old castle designs far less useful and so designs changed. Clearly the walls needed to be thicker and better able to absorb impacts, so earthen ramparts were used. 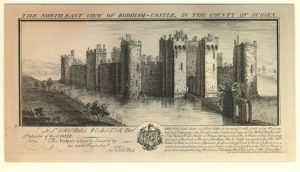 The previously popular round towers were problematic for related reasons – a large bomb called a petard could be comparatively safely placed at the base because there was an area which could not be easily seen from anywhere inside (to be hoist on one’s own petard was to be blown up by one’s own bomb – they were also, more dangerously, used to blow open gate houses and portcullises). Because of this bastions were built which were angled and protruded beyond the walls in such a way that they allowed a clear field of fire across the entire area. Tintagel is something of an anomaly on many counts. It was never a militarily important location, and rarely was it a royal residence. It is seen as key part of Arthurian myth, but there is little suggestion King Arthur ever set foot there. It has been inhabited since Roman times, but the only fortifications which remain are harking back to something that never happened. The great King Arthur was a man, and thus needed to be born and grow up. Before even that he needed to be conceived, and it is at Tintagel that that night occurred, at least according to Geoffrey of Monmouth. Uther Pendragon, Arthur’s father-to-be and King of All Britons fell in love with Ygrayne when he saw her at his coronation. But her husband Gorlois, the Duke of Cornwall was not happy about that and left, taking her with him. Uther used that as an excuse to go to war with Gorlois. There is no suggestion of Ygrayne’s position on the matter – the least worst option here is that she was receptive to Uther’s advances, which is the position Mary Stewart takes. 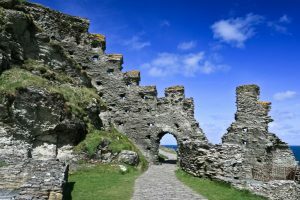 Gorlois led his campaign from a castle called Dimilioc, but he sent his wife to Tintagel as its location made it impossible to breach – Uther is told that three armed warriors could defend the castle against the entirety of Britain – why Gorlois didn’t choose to base himself out of Tintagel as well I don’t know! Regardless, Uther believed this claim, and so called for Merlin’s aid. He asked Merlin to magically disguise him as Gorlois so he could slip past the defences. Merlin worked his magic and created a potion to do the job.